Sarson Ka Saag is a punjabi delicacy. This is my 2nd try. Loved it. I wont tell much about this saag description becoz everybody know this. One of the best popular dish in North India. I was so impressed doing this and also while eating with naan / roti's. 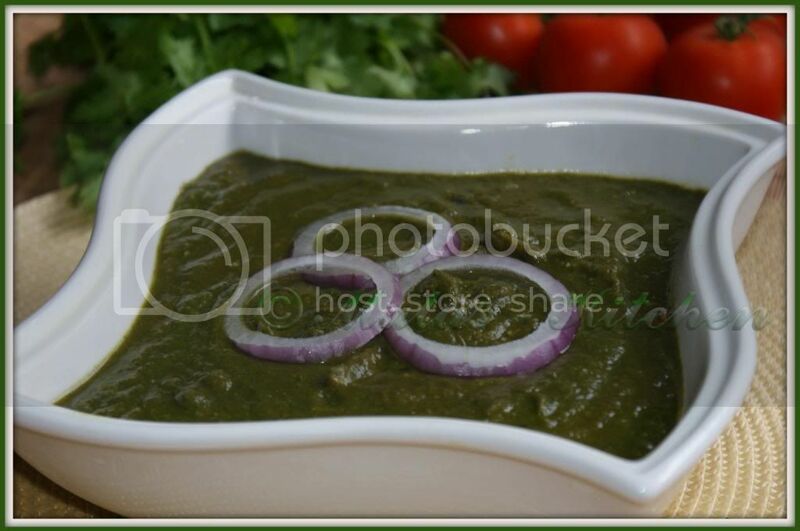 This saag is made of 2 green leaves i.e. mustard leaves and palak (spinach). It gives a unique taste. Wash the leaves and add a little bit of water and cook the leaves with adding pinch of salt and sugar (so that the color of the leaves wont change ) until done. Add cornflour or cornmeal & salt stir well. Stir untile saag should be thick. what lovely color, looks fabulous!! Yum, this is a dish I absolutely love! It looks delicious and so tempting! looks so good and yummy. pretty color. Super healthy, and brautiful colour. Woww its looks so yummy!! This i have'nt tried, will try it.. Vanamala, thanks! Lovely picture!!! looks tasty tooo. You have a great blog Mala. Will try the sweets soon.